Duos and Squads are best when you can play with friends! We realize that our existing social features make it hard to make and/or find friends. We are working on making it easier to play again with people you had a great game with, make new friends, and import your friends lists from other social networks. Certain regions don’t have the Duos playlist (we hear you Oceania!) and we continue to monitor population per platform and region. We are working on a system that is going to allow us to schedule Duos during popular hours so we can offer the mode while maintaining a good experience. We dropped the ball on addressing team killing. We take action based on player reports, but the system isn’t straightforward to use, and doesn’t let you know whether we took action or not. This needs improvement. Last week we started casting a wider net to catch current and past team killers and issued numerous warnings and bans. We are also working on better analytical models to weed out the worst offenders and long term would love to have the ability to pair you with players with good reputation. We've been internally playtesting an overhaul of our shooting model to remove random bullet spread while aiming down sights. We want to improve shooting while maintaining the usefulness of building cover while under fire and without changing engagement distances or the flow of the game. The initial results are promising. The changes need more work and tuning. We are shooting (har har) to provide a test client and servers for you to provide feedback and iterate on this together with us in December. We are working on a big rework to the current inventory. The new interface is cleaner and many of the inventory management tasks are easier to perform. 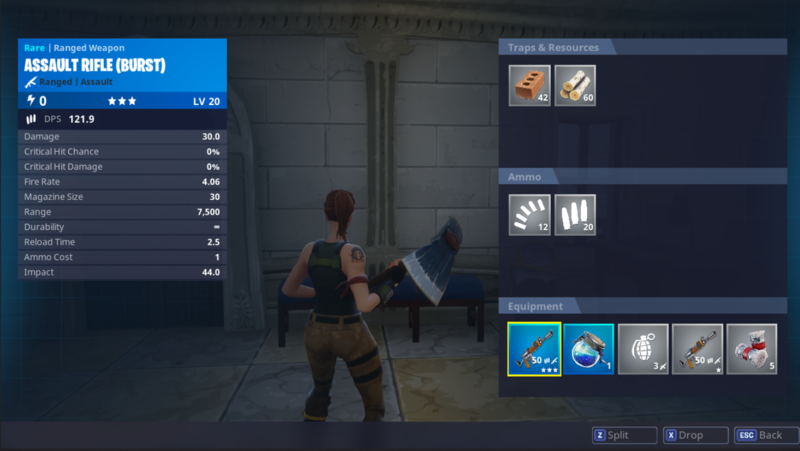 Dropping items is performed by dragging outside the main inventory box and there are quick buttons for splitting and dropping half of any loot to make sharing easier. Additionally, rearranging the quickbar with a controller is now simpler. We want to provide more feedback to you after your match. We’re working on our first stab at a Post-Match Stats screen you can view after you’re eliminated. 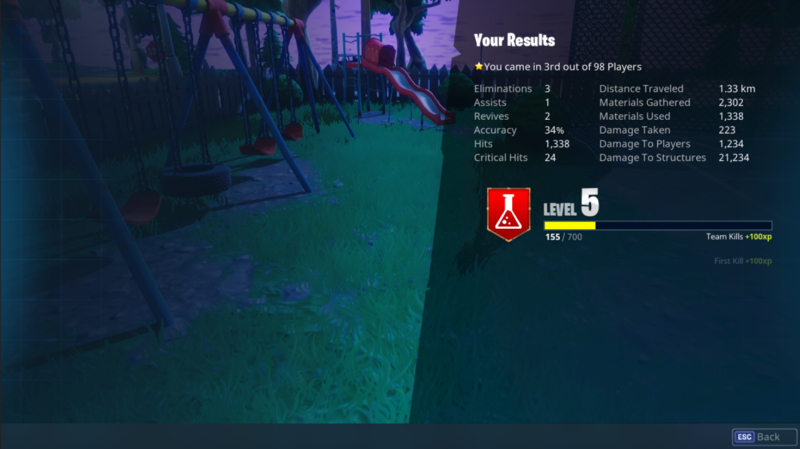 The first iteration shows fun, interesting and relevant statistics from your game, and the experience you earned after you / your whole team has been eliminated. We’ve seen many great suggestions on Reddit and the forums to draw inspiration from -- please keep them coming! We are adding new unique POIs (points of interest) to the map to better fill in some of the empty spaces and introduce more gameplay variety. We are also introducing more variety to the map by updating existing areas (e.g. mountain and swamp region) with unique art for flora and the landscape. You can quickly recognize different regions from up above and on the ground, providing an improved sense of location and place. The umbrella aside, our initial version of gliders focused on texture changes (repaints). The next step is adding more unique detail, while still preserving the original mesh. We’re working on full remodels for gliders, pickaxes, and characters that achieve this vision; please keep checking the store for updates. We’ve received a lot of great feedback on FNBR’s audio, and we’re working to improve mix clarity and provide better tactical information for sounds in the game. Here are some things we’re doing. 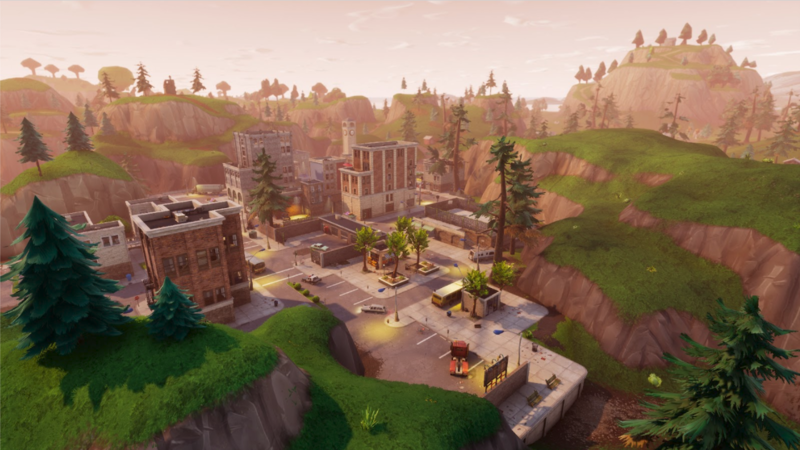 Footsteps on different surfaces: Right now we’ve got one set of footsteps for all surfaces in the game, so it’s very hard to tell when someone is in a building or right outside it. Wood, Stone, Metal, and Water footsteps are coming to give more information to you. Quieter teammate footsteps: For squad players, we all know how loud it can be stomping around with four other people, so we’re reducing footsteps for nearby teammates. Vertical audio: We’re aware of the issues here, especially for footsteps. Investigations are being made in how we can improve this for the future. 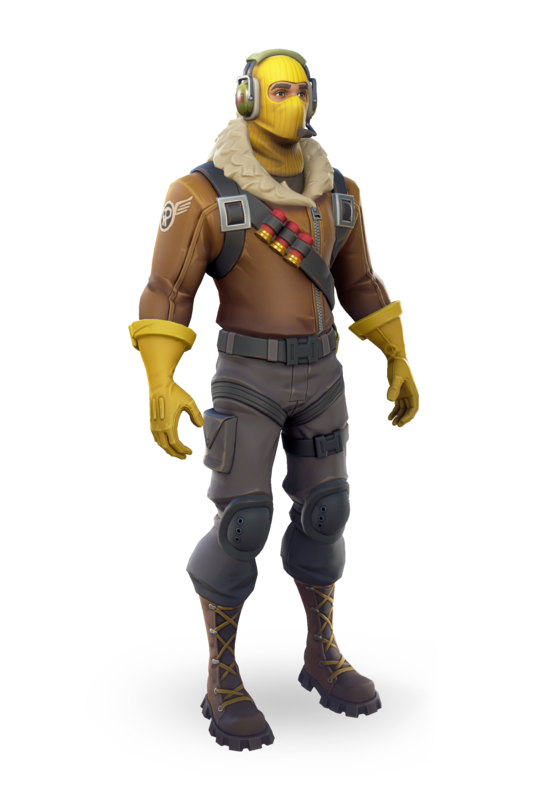 Trap audio: Tweaking is being done for trap audio to make them less consistently noisy and balance volume, while still providing an opportunity for players to hear and react to them. Launch Pad audio: We're making tweaks to the audio of players when they use a Launch Pad. This is to make it a little easier to tell when a player is flying in and about to land near you. If you listen closely you'll have a better chance to react! Weapon audio panning: While subtle, gunshot audio that you create doesn’t follow you, and instead gets left in the world at the point of the muzzle flash. This can cause the audio to pan to the left or right as you move away from it. We’re working on fixing this ASAP to reduce confusion during heated combat. Limited Time Modes: We are introducing Limited time modes in December. Limited time modes are temporary experience with special conditions that provide new ways to play and allow us to run fun experiments. We'll announce what our first limited time mode is soon... it’s going to be EPIC! Server performance optimizations: To follow up on the performance blog -- we’ve made some good progress on optimizing server performance over the last two months. The below image shows the percent of time our servers are “hitching” (missing target frame rate). Solid green means 0% and red is 3% and above. We clearly still have an issue in the beginning of the match, even with us throttling network connection updates to 50 connections per frame! To further disclaim the chart, an all green version would not be something we consider acceptable due to the aforementioned update throttling. We have a good understanding for the foundational networking changes required to reduce and hopefully long term eliminate the throttling. Map Streaming: A large foundational change we’re working hard to ship is extensive streaming. What this means is that as you move throughout the map all content is loaded / streamed in and out depending on your proximity to it. Right now this is only done for textures and there is a lot of opportunity to save memory by extending it. There are a host of technical challenges related to persistence (making sure damaged areas are streamed back in as such), performance (eliminating hitches due to background streaming), and making sure the streaming system works fast enough to support rocket riding! The main upside of streaming is having more memory available and this change is required for us to ship updated map POIs, badass cosmetics, etc. Regions: We are still working on our matchmaking system and expect to run more data centers in the first quarter of 2018. One big change coming up before then is making sure we have better quality of service and experience in Asia. Controls: Aim assist behavior is being adjusted to be more similar to other games you may know. This is taking a bit longer than we thought, but we’d rather get it right and are still tweaking it to avoid shipping it too early (*cough* scoped sensitivity *cough*). Leaderboards and Stats: Our initial rollout of leaderboards and stats was quite feature limited. It however allowed us to gain insight into what kind of load they generate on the backend. Turns out the answer is “a lot”. Bad news is that we need to focus on scalability first; good news is that we have a better understanding of what we need to build. We want more stats… a lot more stats. Stats and leaderboards serve a different purpose for different people, and we want to be inclusive to all types: pointing out areas where you are excelling, providing stats so you can see how you are improving over time, better metrics for leaderboards to compete with friends and the people around you, and yes, even global leaderboards for those of you with big ambitions. We can run static snapshots fed by our analytics like we did with an email a few weeks ago and the plan is to play with this a bit more while we are working on scale. There are also partybus.gg, stormshield.one/pvp and fortnitetracker.com, which are third party interfaces to our existing stats. Season Store: We’re significantly evolving the concept of the season store. The next season will combine a single purchase pass system containing tons of loot that can be acquired as you play and complete quests. We are also adding free seasonal loot that can be earned by just playing. More Items and Weapons: We’ve added a number of items recently - the Bush, Launch Pad, Silenced SMG, Slurp Juice, Smoke Grenades… etc. We’re just beginning to scratch the surface of what we want to do here. Custom games: We have early efforts exploring how we can expose tournament support, custom matches and leaderboards, and then combine that with the ability to modify some of the game rules as an offering. Custom games and tournament support also leans on spectator support. So yes, we’re working on a fully functioning spectator system and we look forward to sharing more details next year. Performance over visual fidelity: Our near term focus is providing a rock solid 30 FPS experience on consoles. We are figuring out the best ways to give you more choice on the latest next generation consoles. Badges/Medals: We want to introduce medals we can give out during games that highlight amazing plays like e.g. a mid-air kill with the rocket launcher. Our goal is to be transparent and accountable. We spend a lot time reading your comments and posts, so please let us know when we are not living up to our goal!